WMP produces millions of Scripture booklets every month as the Lord provides. We are in need of volunteers to help on the binderies. Volunteer groups consist of 4 to 10 people from 14 years old and up. Each group needs a minimum of one 16 year old and one 18 year old. Shifts run from 8 am to 11:30, 12:30 pm to 4, and 7 pm to 9 pm Monday thru Friday; and Saturdays from 8 am to 12, and 12:30 to 4:30 pm. Also consider scheduling a “Midnight Madness” (Friday evening from 9:00 pm to Midnight) or an “Around the World Overnight Missions Marathon” (Friday evening from 9:00 pm to 8:00 am Saturday morning). Looking for a missions outing for kids age 9 to 13? We have a new program for younger volunteers called The Box Brigade. Maintaining a 7 million per month pace of production requires 15,000 boxes per month! Do you have a middle school group that could help us assemble boxes? Interested in a worthwhile family activity with eternal impact? If so, please contact our volunteer coordinator to arrange a time for your group to come assemble boxes. We love our volunteers! WMP would have a difficult time operating without the generous support of our volunteers. During a recent three-month period, 700 volunteers from 106 churches donated their time and energy to help produce and send out Scripture booklets. 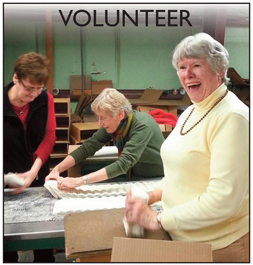 While volunteers primarily work at our booklet binderies in 2-, 4- or 8-hour shifts, they also help with mailings, New Testaments, and maintenance around the plant, such as cleaning, painting, mowing, and general upkeep. If you or your church group are interested in volunteering, please contact our volunteer coordinator at 574-831-2111, ext. 215, or by email: volunteer@wmpress.org. Eager to help? 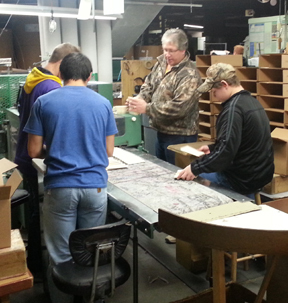 Get a head start by watching our training video for bindery volunteers: click here.